I love reading people's wedding stories on their blogs, and I hope you all feel the same because this will, I'm sure, be just one of many posts I write about our wedding. As I said yesterday, I don't have any of our professional pictures yet, and probably won't for awhile, so for now, I've pulled this together with what's been posted on social media by our friends and family members! 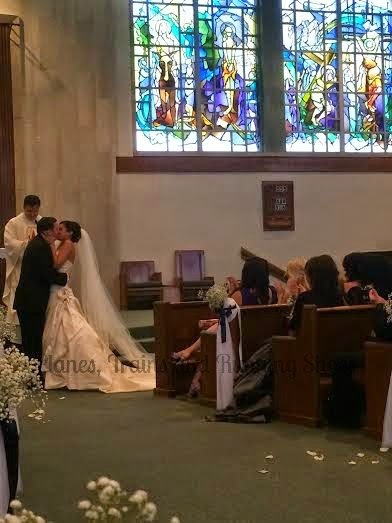 I don't have any pictures from before the ceremony, but I'll say this. I had every intention of waking up the morning of my wedding and going for a run. My friend Emily was going to join me. When I woke up an hour before my alarm, I texted her to see if she was up. She was, so I got dressed and went to grab my sneakers and realized that I had never brought my sneakers or socks to the hotel! Not intending to let anything ruin the day, Emily and I went for a nice, long walk, which was perfect. When I got back, I showered, ate, and started getting ready...and it started raining...and then it started pouring. By the time I left for the church with my mom, it looked like one of those days where it's just going to downpour all day long. Knowing that this would move our pictures and our cocktail hour indoors, I was pretty upset about it, but our photographer was amazing and was reassuring me that our pictures would be perfect, even if we had to take them indoors. Our ceremony was at a church in Arlington at 2:00 and I was determined that it would start at 2:00 on the dot, and it did! 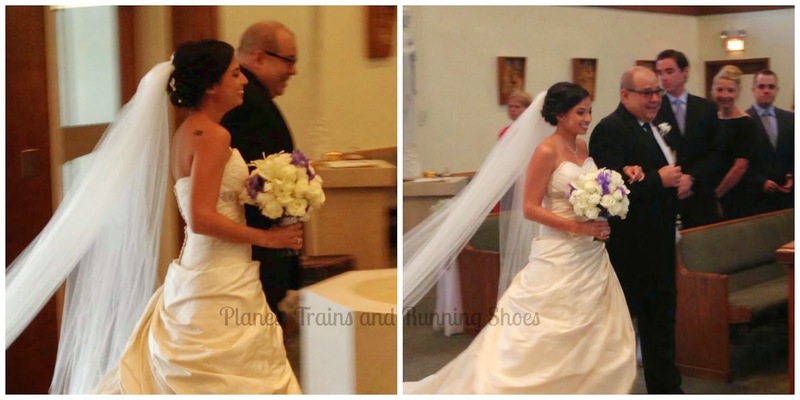 My dad walked me down the aisle. Our church is tiny, which is awesome, because as soon as I walked in, I saw everyone in the pews. 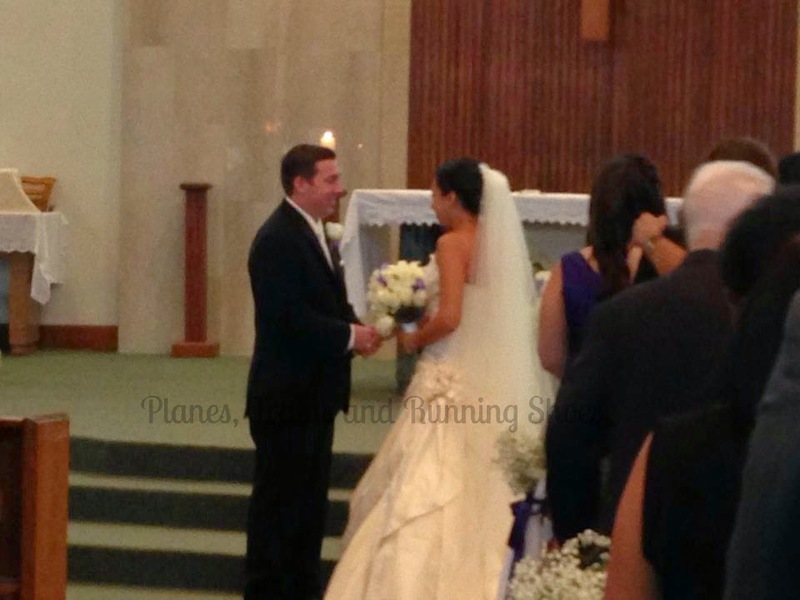 I couldn't see The Pilot because his brother (the Best Man) was standing outside the pew, directly in front of him! I may have walked in just a little too fast because I was so eager to see him! When I got to the top of the aisle, and he took my hand, my legs just started shaking! I wasn't nervous, but I was so excited and everything just finally hit me...it was finally here, we were getting married! We didn't do a "first look" so this was it! We had a Catholic ceremony and it was beautiful. The music brought me to tears. Our cantor (who we found somewhat last minute after the first one backed out of our wedding) was amazing! The ceremony went by pretty quickly. It was done in under an hour (which is very quick for Catholic weddings!) and we were officially declared husband and wife! 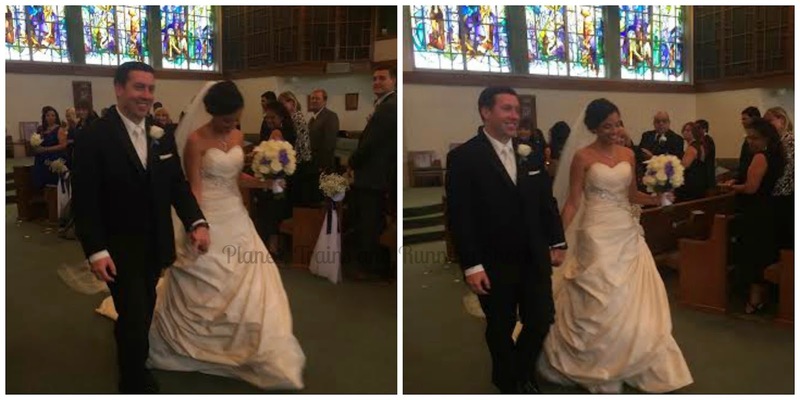 After our first kiss, we made our way back down the aisle together. As soon as we got outside, the first thing I yelled was, "It stopped raining!" Questions about our wedding or planning for me OR him? I'm happy to do a tell all/ask the pilot with answers! Just post them below! Whoever caught that picture of your first kiss deserves a gold star!! You looked beautiful! Your dress came out gorgeous! You look beautiful. How wonderful it all looks.